These little black spots are sometimes smeared making them look almost like pencil marks. They are actually bed bug droppings which is pretty gross. If a Bed Bug has recently fed and is somehow crushed by you on their way back to their hiding place, they will leave a red blood stain on your sheets, pillowcases, pajamas, or mattress. These blood smears may be easy to miss or mistake for something else, so remember to look closely. 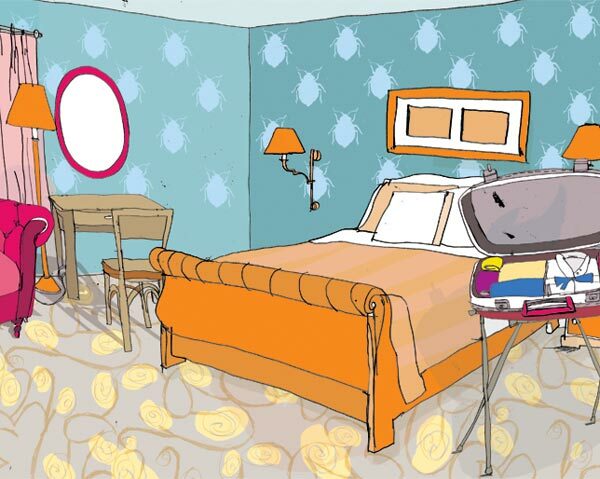 While inspecting your room, it’s possible you might run into the bed bugs themselves, either alive or dead. These pests vary in size and color depending on their age. When they’re young, they are white or clear colored and turn reddish brown as they become adults. It takes only 3 weeks for the bugs to become fully grown, and although many incorrectly believe they are microscopic in size, adults are usually larger than ants. Now that we've established what you should look for, let's go over where you need to check! The first thing you should always do is pull back the fitted sheet and inspect the seams and edges of the mattress. See if you can find any bugs or black spots. Also check the corners of the bed frame. Next, see if you have any couches or cushioned chairs in the room. Just like the mattress, look at the seams and edges (especially around the zippers) to look for signs. Bed Bugs love clothes, so it’s important to check where they’re usually kept. Look at the lines where the closet meets the carpet as well as the crevices inside the closet and drawers. If the unthinkable happens and you accidentally do bring Bed Bugs into your home, there's no need to worry. There are some surefire ways of getting rid of these pests and we at UnBugMe are here to help. Give us a call today or click the link below, and we can talk you through the process to getting your life back on track!